Memphis BBQ Sauce on Steaks, chops is more than just bbq dry rub. Our Memphis 2 Pack is a powerful Memphis Style dry marinade and an awesome flavor creator all in this luxurious 2 Pack. And though you may not be able to go to Memphis In May each year you can have our outstanding, inspired, traditional Memphis Blues Style Dry Rub. The dry rub is slightly spicy and tart with subtle hints of celery seed, garlic, mustard and more. When you pair it with baby back ribs you get hints of Old Memphis combined with sparks of pepper and touches of mustard. Our Memphis Blues Dry Rub has received numerous awards for originality and taste. We recommend that you get your hands and your grill on this Dry Rub for baby back ribs by clicking add to Cart. 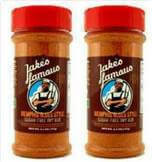 Try something truly great today with Jake's Famous Memphis Blues Style Dry Rub. Buy Jake's Famous Memphis Blues Dry Rub 2 Pack Today by Clicking Add To Cart and Ordering Today!